If you have a small business or any type of local business, you know getting customers to call you and/or come in is crucial to your businesses success. In the not too distant past, it was most common for customers to find you by going to the yellow pages and pulling up listings for whatever service you provide. Those days are over. Today, the only time someone picks up a yellow pages book is usually to grab it from their front porch and put it in the recycling bin. Today, people search for businesses online and if your business can’t be found, you might as well not exist. That’s the hard truth. The internet has completely changed how potential customers search for and find a local business. 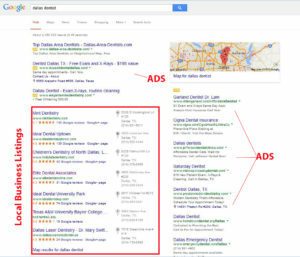 Today, the vast majority of customers will pull up their favorite search engine and type in a search such as “dentist in Dallas” or “hair salon Houston” or whatever they were searching for and will be shown quite a few local results. Run any type of local search at any of the top engines these days and you’ll see two types of non-paid results. The first type of results you’ll see are often termed “local business listings”. They show the local business name, address, phone number, and show them on a map. Check out the image below for an example. 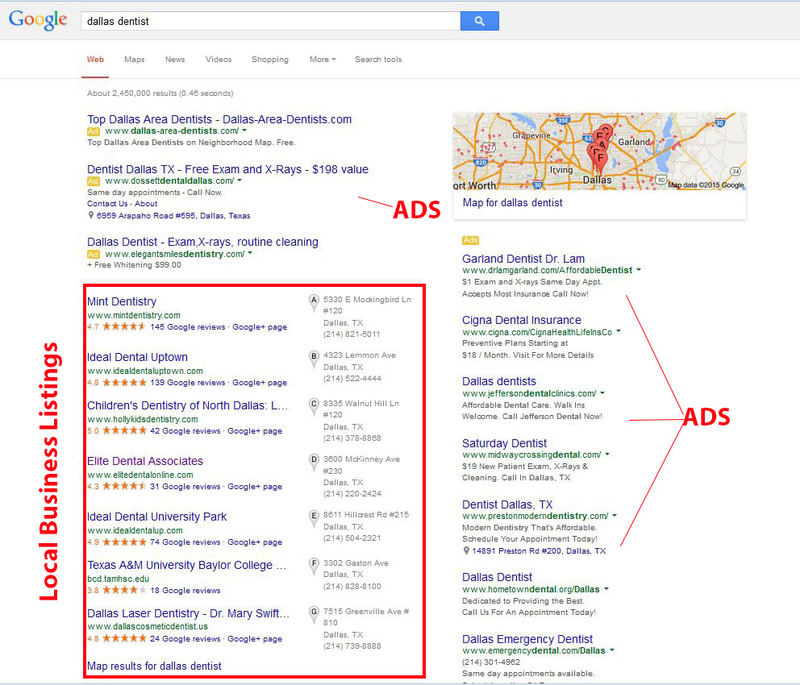 You can see in the above image, the first non-paid results returned by Google for the search phrase “dallas dentist” is a “7 pack” of local listings that correspond to the map on the right hand side. It’s not until after the 7 pack of local listings that we get to the standard organic results. Ranking well in the search engines for your target phrases has always been important, but with the prominence of the local business listings in the search engines today, ranking in the 7 pack is critical. Ranking well in the 7 pack will generally mean you’ll also rank well in Google Maps and similar services. This is called “Local Business Listing Optimization“. The issue with ranking in the 7 pack (it’s not always 7 listings…it can vary from one to three or sometimes five), is that the criteria is quite a bit different than the criteria for ranking in the standard organic results. Let’s take a look at some of the factors that go into the ranking of the local business listings in Google specifically. A citation is basically a reference to your business from another site that includes your business name, address, and phone number. These includes things like the BBB, Yelp, yellowpages.com, etc. The more citations you have the better, but it’s not just the number of citations, it’s also the quality of the source of those citations. A citation from the BBB is going to carry more weight than a citation from a random blog. The local business listings in Google are pulled directly from the Google My Business (formerly Google Plus Business) database. This means you want to make sure your listing is claimed and built out and optimized well. This means choosing the best possible category, completing all the sections of your Google My Business Profile, including plenty of your important keywords/products/services in your description (without looking spammy), images, etc. Initially, Google only looked at what was in the Google Plus Business listing in regard to ranking a local business listing. That began changing over the past year and now they also take into account what is actually on your business website. This means the on-page optimization of your website also affects your local business listing. Since Google wants to display local businesses that are not only quality businesses, but also convenient businesses, the location of the business in relation to the where the person doing the search is plays a factor. The farther out a business is from where the search is being performed, the more of the other factors above they would need to rank in the 7 pack. This is especially true in regards to searches performed on a mobile device as Google and other engines are able to know exactly where you are from your mobile devices GPS system. For desktop searches it’s a bit different. Since they don’t know precisely where you are, they generally take the city and show favoritism to listings closer to the center of the city. In addition to using citations as a sort of trust factor, Google also seems to look at what else those citations say about your business. This means a good description utilizing the keywords you want to rank for along with those citations will impact how well, and for what keywords your business ranks for in the local listings. This should come as no surprise, but having lots of, ideally positive, reviews will also positively impact a sites ranking. Reviews at Google seem to have the most impact, but having reviews spread across all sites that allow reviews is the best approach. Sites such as Yelp, Yellowpages.com, Superpages.com, etc. all allow for reviews and Google spiders them all. The more positive reviews Google finds about your business, the better your chances are of ranking in the local listings. With local listings taking more and more screen real estate and being displayed first for more and more searches, it’s imperative for any local business to insure that they are doing everything possible to get their business ranked in these listings. Platinum SEO Services are seasoned professionals at SEO and Local SEO and can easily help virtually any type of local business increase their presence in both organic and Local Business listings. With over 15 years in the business, why put your trust in anyone else? Contact us today to see what we can do for your business.